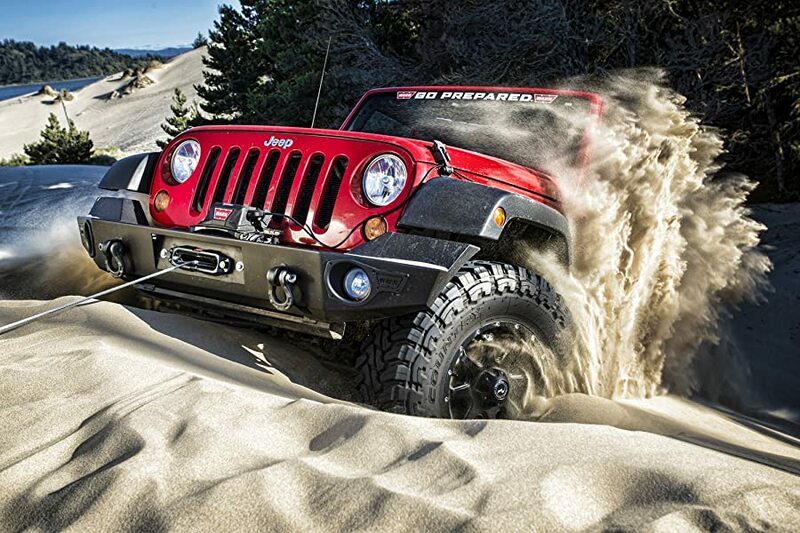 Home » What’s The Best Winch for Your Jeep? If you have a new Jeep and you’re prepping for some off-road fun, adding a winch is something you should definitely consider. However, there are so many options out there to choose from, buying the best winch for Jeeps can be a daunting task. There’re many factors to consider here, such as what type of winch rope should be used, how much capacity is enough for a Jeep, which brand is the best to buy, and finally how much do you want to spend. Depending on your needs and budget, this is our detailed guide that will help you make the best-possible winch purchase. Don’t forget to check out our guide to choosing the best battery for your Jeep with a winch at the very end of the post. 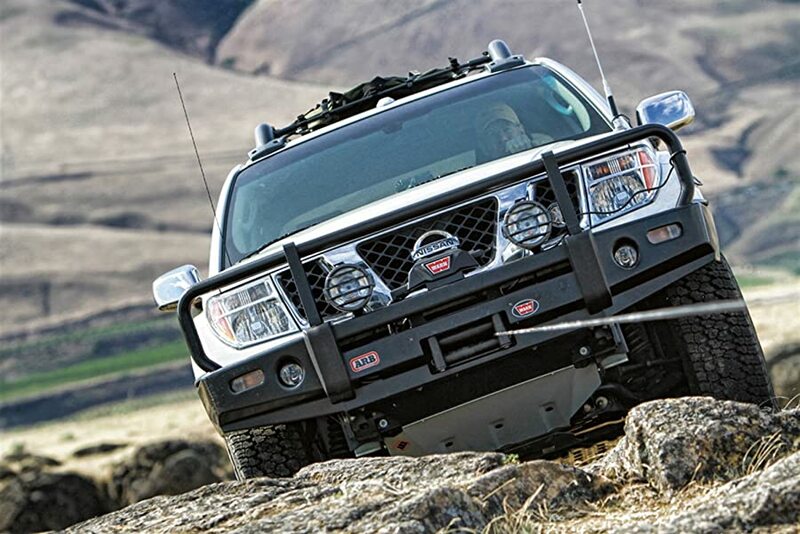 Read More: How to choose the best Winch for Your Truck? If you’re looking for a well-built and reliable winch for your Jeep, look no further than the Smittybilt X2O Waterproof Winch. This 10,000 lb winch is surprisingly high-quality at a very reasonable price and features an integrated wireless remote control for ease of use and maximum versatility. When you or someone else gets stuck on a trail, this winch can make a recovery far easier and quicker. It will survive all kinds of trail conditions, in part because it’s waterproof. This winch will work on any 1987 to 2018 Jeep Wrangler YJ, TJ, or JK. You can get this winch with a steel cable or synthetic rope. 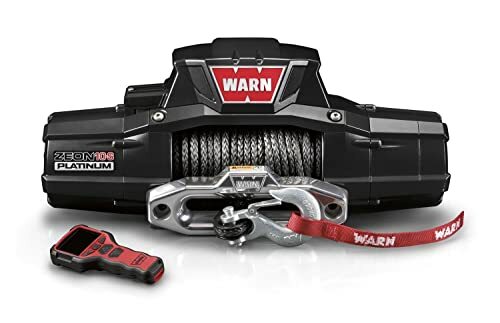 If you’re after a winch with the highest quality in the industry, there is no better choice than the Warn’s winches, and the WARN 92815 ZEON Platinum 10S with Wireless Remote is our favorite model. Warn’s winches are known as the most expensive winches on the market, but they are the absolute best winches for your Jeeps for many reasons. Durable, reliable, strong, and fast. In the toughest situations, Warn winches perform by far better than the rest. If there’s extra room in the budget, Warn winches are the way to go. How to Choose The Best Winch For Jeeps? When it comes to deciding what winch is best for your Jeep, an important thing you will need to decide is what size winch to get. Obviously, the heavier the vehicle, the stronger the winch you will need to pull yourself out of a bad situation, a good rule of thumb is your winch should be at least 1.5 times the weight of your Jeep. If your Jeep is stock other than the winch you will be adding, you can just multiply your gross vehicle weight rating (GVWR) by 1.5. You can think of the GVWR as a weight limit for your Jeep — a weight limit set by the manufacturers. GVWR take into account the base curb weight of the vehicle plus the weight of any optional accessories, cargo, and driver. The GVWR is designated by manufacturers. While you’d think it’d be easy to find online, it isn’t. Instead, go out to your rig and find it! All Jeeps have the GVWR marked on the body. It’s usually on a tag on the driver side door jamb. With winches, Bigger Is Always Better! Even though 1.5X is the industry standard, the best winches for Jeeps should have the capacity that is more than that. For instance, a common cause for winching is mud. Mud, however, has an incredible suction force on a stuck vehicle and in many cases that 1.5 rule of thumb is far inadequate. Steep hills and frequent winching also put a great demand on an electric winch. Trying to save a buck on that winch purchase by getting a smaller winch could be a huge mistake in such situations! Also, a bigger winch is less likely to stall, less likely to overheat, needs less cool down time, and has more power when you need it most. So, how much pull is enough? For most Jeep models, a good 9.500 lb. or 10.000 lb. winch, such as the Smittybilt 97495 XRC Winch or the Warn 89611 ZEON 10-S Winch, will be more than enough for 99% of your winching needs. Most people are around 5500 to 6500 lb for a fully built rig so the best winches for Jeeps should never be less than 9000 lb. Also, keep in mind it’s rare to actually approach anything close to a 15.000 lb. pull, so getting a winch with a rating of more than 15.000 lb. might be a waste of money. We would say a 9.5k-12k winch will be sufficient for pretty much any Jeep out there. But when in doubt, go bigger. Synthetic Rope vs. Steel Cable – Which is Better? Once you find out what capacity you’re looking for, you have to choose what rope you want to have: steel cable or synthetic rope? Steel cable is the traditional choice. It has been around for a long time in the winch world and is still very popular today, mainly because it is very strong and rugged. It’s what is wound around the winches that come directly from the factory. This kind of winch line has a lot of things going for it; it’s heat resistant, abrasion resistant, relatively inexpensive, and is low maintenance. However, steel cable does has several drawbacks. Steel cable can rust, as well as develop sharp burrs as it wears, requiring gloved hands to operate. These burrs can easily cut through skin like a knife. One of the most dangerous issues with steel cable is it stores a lot of energy meaning if it snaps it can slice a person in half. Steel cable is also significantly heavier than synthetic rope. There are reasons why most of the best winches for Jeeps on the market today come with the synthetic rope. Synthetic rope is much less likely to cause injury than steel cable in the event of a break, as it’s lighter and loses tension rapidly, falling to the ground. If a break were to happen, the synthetic rope can also be re-braided in the field using the proper technique. It is a temporary fix to get you out of a bind, but it’s more than you can do with a broken steel cable. What most people like about synthetic rope is it is easier to handle than the steel cable considering the steel cable’s rust and sharpness, so you don’t necessarily need a glove when handling the synthetic rope. Despite being much thinner and weighing only 1/7 of what steel cable does, synthetic rope is very strong. It is also highly flexible, easy to handle and floats – making it perfect for winching from mud or water. On the downside, synthetic rope requires much more maintenance than steel cable does. Synthetic rope is very susceptible to UV exposure, chemicals, heat, and abrasion, so you might get your winch a cover to protect it from damages. For some Jeepers who live in a very cold area, you have to be very careful when your synthetic rope gets wet since it can retain water and can easily freeze and your winch will be turned into nothing but a piece of the ice block. Either style of rope will get the job done as long as they are in good condition. When it comes down to it, maintaining your winch and the terrain you ride factors in, but mainly it’s your personal preference. The facts are here, it’s up to you make the decision. The best winch for your Jeep is the best-possible one you can afford. A winch with the synthetic rope is strong, flexible and safe, but it would be significantly more expensive than a winch with the steel cable. 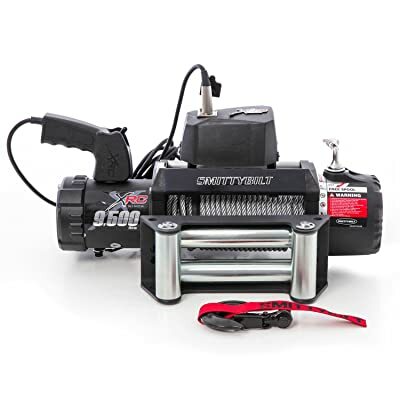 An inexpensive steel cable winch, such as the Smittybilt 97495 XRC 9500 lb. Winch, may save you a lot of money. Electric winches are the most common types of the winch, they are widely available and typically inexpensive. Shopping around for deals and a great selection will be easy. On the other hand, there are very few manufacturers who offer hydraulic winches on the market. In fact, most hydraulic winches on the market are Mile Marker’s hydraulic winches and they are also the only winches that worth considering. An electric winch is exactly as its name would suggest: it is electrically powered by a vehicle’s battery, and as a result, its duty cycle is limited by the amount of juice in your battery. An electric winch can give you five minutes of full power pulling with a dead engine, but seldom do electric winch-equipped Jeeps have the electrical system necessary for continuous use. The real benefit of an electric winch is that it doesn’t require the engine to be running to use them. This is important, as there are many situations in which your Jeep can be stuck and not has an operating engine. On the other hand, a hydraulic winch is powered by a vehicle’s power steering pump. What this means is that they are capable of an extended, seemingly endless duty cycle for longer pulls and a persistent flow of pulling power. You can winch all day, every day with a hydraulic as long as the engine is running. However, for the occasional use most Jeepers subject a winch to, an electric winch is more than adequate. Which winch is the best winch for Jeeps? Essentially, there’s no wrong decision either way. But what this guide boils down to is the fact that electric winches are far more universal. There are many more models of electric winches available, and they can be installed on just about any Jeep version with mounting kits. Additionally, they are much easier to install or remove, and often include more choices in slick features than their hydraulic counterparts. Generally, we think an electric winch is best suited to your needs, but if you’re interested in a hydraulic winch, the Mile Marker H-Series Hydraulic Winch – 10,500-Lb is a great one to consider. What’s The Best Winch Brand For Jeeps? Here’s an overview of some of the top winch manufacturers on the market. Warn is definitely NUMBER 1. The toughness that’s built into every WARN winch has become almost legendary, so it’s no surprise WARN winches are the best-selling winches of all time. As far as we know, most Warn winches are made in the USA, that’s probably why they’re such expensive. In 1959, it was Warn Industries that developed the very first recreational winch. WARN winches have been a staple for off-roaders ever since. They’ve maintained their spotless reputation over the years by simply being one of the best. Time and again, WARN winches outperform the competition in head-to-head tests. Whether you need a winch for your Jeep, truck, SUV, ATV, or even a commercial application, Warn Industries has you covered. 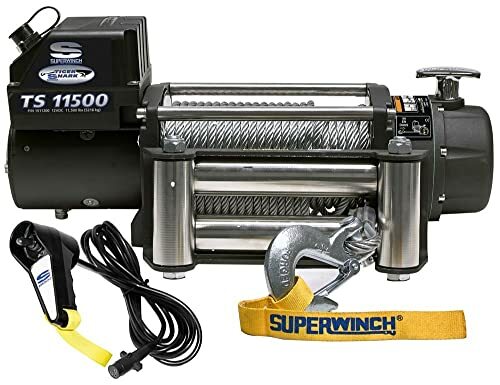 Superwinch makes some of the best winches for Jeeps on the market, such as the Superwinch Tiger Shark 11500 lb. 45 years ago, the first Superwinch began as a project of Ford Motor Company. Nowadays, the company is one of the largest manufacturers of winch systems and accessories in the world. Superwinch winches have an outstanding reputation in the marketplace for their superior design, reliability and value proposition and have established a loyal following among off-road enthusiasts. 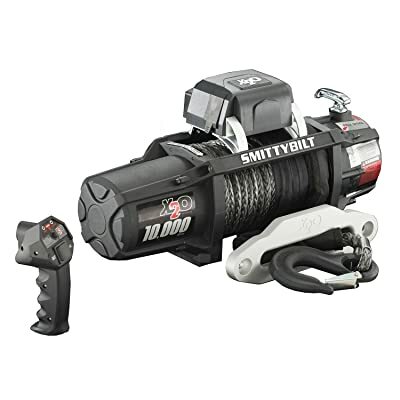 Smittybilt offers many high-quality winches for Jeeps at an inexpensive price. If you can’t afford to Warn, Smittybilt winches are a great alternative to buy. Smittybilt has been making the XRC series winches for several years. It’s a popular winch with many 4×4 and off-road enthusiasts, and is known for its strong Smittybilt construction and real-world reliability. The X2O series winches have all the great attributes of the standard XRC series, but with a few more features such as wireless remote, dynamic braking system. One of our preferred models is the Smittybilt Gen2 X20 10,000-pound winch with synthetic rope and wireless remote. This is a perfect winch for those of you having 1987 and up Jeep Wrangler, and are looking for a waterproof, very well-built winch that comes with a synthetic line on it. As the official supplier of winch equipment for the US Military, the reliability of Mile Marker winches is a foregone conclusion. In fact, the hydraulic Mile Marker winch is the only one that is approved for Humvees in the US Military, making it a great choice for anyone who’s excited to do some serious off-roading. Although it’s their patented hydraulic winch that they’re most known for, Mile Marker also offers a full line of electric, ATV, industrial, and utility winches. 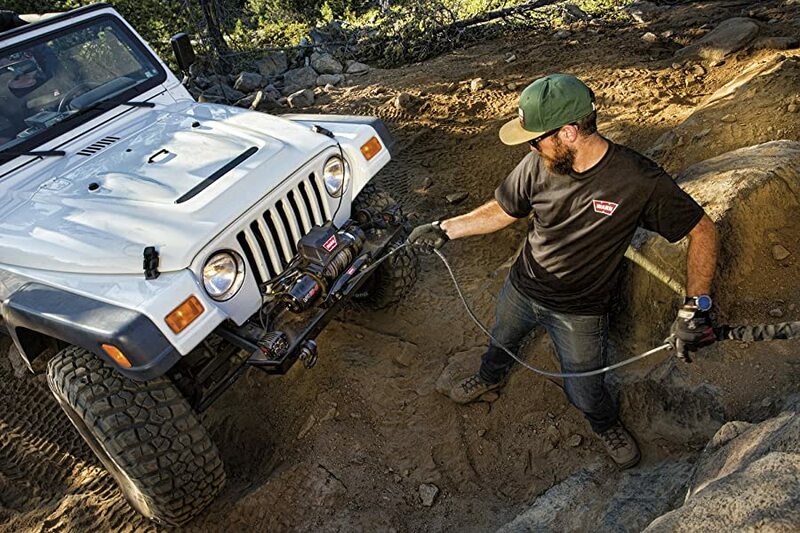 Rough Country makes some of the best electric winches for Jeeps and trucks. Rough Country winches have a relatively high quality but are less expensive than Warn, Superwinch, and Mile Marker winches. That’s probably because Rough Country (and Smittybilt) has been making their products in China, while most of Warn, Superwinch, and Mile Marker winches are made in the USA. Now, it’s time to see some of the best winches for Jeeps on the market that we think you should buy. If you’re looking for a well-built and reliable winch for your Jeep, look no further than the Smittybilt X2O Waterproof Synthetic Rope 10,000 lb Winch. This 10,000 lb winch is surprisingly high-quality at a very reasonable price and features an integrated wireless remote control for ease of use and maximum versatility. The X2O winch features a Series Wound 6.6 HP motor that is completely sealed, as well as a 3-Stage Planetary Gear System. It features a completely waterproof 500 AMP solenoid pack that can be mounted in 2 different locations, depending on your application needs. It also includes a new controller that can be wired to the winch or unplugged for trouble-free wireless operation. The WARN ZEON Platinum is the absolute best winch for Jeep Wrangler owners who like to push the limits on the trail. It is the winch of choice for your Jeep when off-road driving is more often your style of driving and on-road use is only when necessary. The 10.000 lb pulling capacity highlights the true value of a high-performance motor with stronger gears. The heat-treated ring gear delivers a 20% faster line speed. Pulling a 100′ of rope at that speed, the Zeon Platinum winch makes towing serious business. The use of the remote-controlled system makes using this winch must easier. With the remote-controlled system, you are afforded longer distances to operate the winch. The addition of the mechanical cone brake offers an additional measure of control while operating the winch. 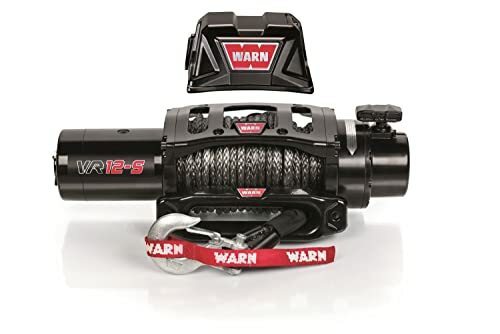 The Warn Zeon Platinum winch is a durable, lightweight and extremely waterproofed winch features an aluminum structure with a flat black powder coated finish and stainless steel fasteners. This design affords the winch the maximum in corrosion resistance. The overall look and design are fitting for the adventurous one while still offering the practical nature for on-road driving. You can get this winch with a steel cable or synthetic rope. The WARN VR 12-S Synthetic Rope Winch is one of the best winches for Jeep owners who demands a winch that will perform under the most extreme conditions in the world. It’s driven by a powerful motor designed specifically for winching and features a waterproof Albright contactor for excellent electrical reliability. An all-metal tie plate system adds structural rigidity and reduces noise while a patented cone brake system holds the full rated load, even when powering out. All of the new VR winches now come with standard duty synthetic rope, pre-wound onto the drum right out of the box. The VR winch line has also been equipped with an industry leading tie plate to replace the earlier tie rod configuration, adding structural integrity and strength to your winch, and to add to ease of use, all VR winches now come pre-wired and ready to install right out of the box. The newest line of recovery winches from Superwinch is the Tiger Shark. This entry-level model offers many of the same features as the high-end Superwinch models but at a fraction of the cost. The sealed 6 horsepower series-wound motor efficiently delivers quick, safe line pulling and will respond to an increase in load by slowing down or reducing the current to minimize the risk of overheating the motor and damaging from rain, snow and blowing dust. In addition, the winch comes with a handheld 12″ rubber remote you can have an easier time with optimal range. When using the winch at an angle, the Superwinch roller fairlead guides the wire cable onto the winch drum. It is designed to reduce friction so the cable is protected from wear that can cut short its service life. The roller fairleads also keep the cable from building up on one side of the drum. 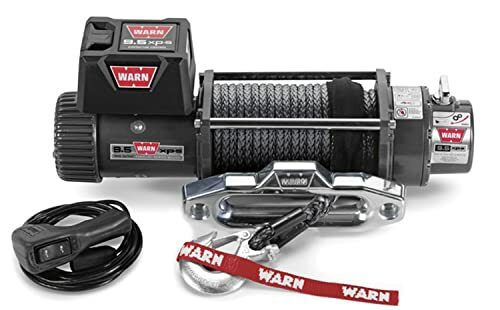 If you’re looking for the best winch for your Jeep with the longest duty cycle and fastest line speed, consider the Warn 9.5xp-s Winch with Synthetic Rope. This winch is the fastest of any Warn winch under load, yet it weighs just 87 pounds. Its 9,500-pound bottom-layer line pull comes from a heavy-duty 6hp motor connected to a three-stage planetary gearset. It also incorporates a continuous duty control box that allows for long, hard pulls. In addition to its fast and powerful motor, the full face contact drum seals and end housing gaskets deliver extreme-duty water resistance. A high gloss, chip resistant powder coat finish over chromate coated alloys affords superior corrosion resistance. For the off-road enthusiast looking for the power of a hydraulic winch, the Mile Marker H-Series Hydraulic Winch 10500 lb is a perfect choice. This hydraulic winch is independent of its solenoid control valve and offers the most versatility for recovery operations due to its ability to be mounted to the front or rear of the vehicle as a permanent or detachable system. Completely element proof construction, corrosion and water resistant, the power and strength of the H-Series hydraulic winch is harnessed using the vehicle’s power steering system as its power source, allowing for a continuous and reliable power supply without any battery drain. These features make it the best winch for Jeep Wrangler owners who do a lot of winching. 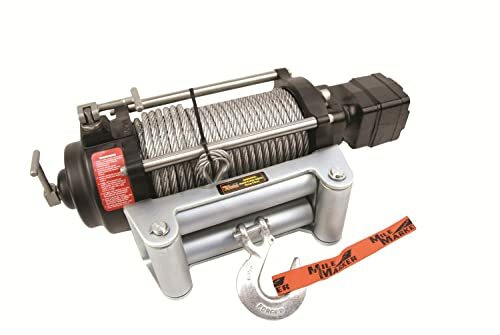 The winch features two speed spooling, a mechanical lock system, stainless steel tie bars and fasteners, 100’ of steel cable, 10,500 pounds of pulling capacity and requires a vehicle specific 34 Series valve adapter kit for installation and operation. What’s the best battery for your Jeep Wrangler with an electric winch? Batteries are not a built-in part of an electric winch but they are one of the most important parts as they are the power source of the winch. The problem is that the starting batteries in your Jeep are designed primarily to start the engine, but may not be suited to handle the discharges required by winching. Starting batteries do not like being deeply discharged and will die when used this way often. A typical deep cycle battery can handle the discharges but may not have enough cold cranking amps to be a good starting battery. So, what’s the best battery for winching? The answer is a marine battery (or a dual-purpose battery). These batteries are more robust and capable of both starting your Jeep and deep discharge cycles. And the best type of marine battery is AGM (Absorbent Glass Mat). If you go with a standard car battery, find the largest one that will fit, highest amps, highest Cold Cranking Amps (CCA). A good idea is to add a second marine battery to your Jeep devoted solely to winching. Optima and Odyssey provide the best marine batteries on the market, they should be the first options for considering. The Optima Yellow Top D75/25 Dual-purpose battery and Odyssey Thunder Marine Dual Purpose are good choices here for most Jeep Wrangler.